Parents can relax knowing that the children will be well-entertained and everyone will enjoy the trip. Simply choose a tour from one of the ready-made itineraries to fit your schedule, interests and budget and off you go! If choosing a private tour for your family, you have a lot of flexibility and none of the hassle of planning all the activities. We have often chosen this route, specially when traveling with a larger group that includes the grandparents and the kids. It is much easier and stress-free, which makes it more enjoyable for the one that ends up making all the arrangements all the time! Also if traveling with very small children, the private tour route is the only way as there are age restrictions (usually minimum of five years old) for the family group tours. 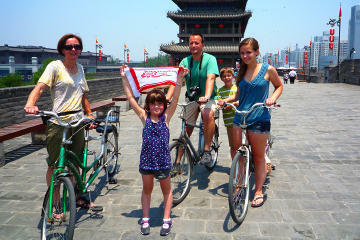 There are many companies offering a number of Family China Tours from 10 days to 3 weeks. Family China Tours take you to the major highlights of China, such as the Great Wall, Forbidden City and the Terracotta Warriors in Xi'an as well as to many of the out-of-the way places not in the regular tourist itinerary. Here is a selection of Family China Tours offered by several tour operators covering a wide range of destinations, duration and budgets for you to consider. The offerings vary widely and they should give you a good starting point. 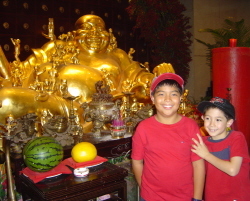 Adventures by Disney Family Vacation: This is a 12-day tour covering Beijing, Xian, Chengdu, Guilin, Shanghai and Hong Kong. It does cover A LOT of ground, and in all Disney fashion, they go all the way, this is certainly at the top of the scale with first rate luxury accomodations and arrangements. Besides visits to the top China destinations, activities for the kids include dressing up in Chinese Imperial costumes, creating your own souvenirs with the help of a master kite maker, a master calligrapher and a master opera mask painter, rickshaw rides, knot-tying and paper-cutting, privately guided visit to the Pandas, face-changing opera, learning tai chi, fan dancing and martial arts... every day will be filled with unforgettable one-of-a-kind experiences. It of course comes with a price: Adults From $6,859 Children $6,649. Minimum Age is 4. Intrepid Travel Land of the Dragon: This is a 13-day tour covering Beijing, Xian, Chengdu, Yangshuo and Hong Kong. Intrepid Travel tours are known for their smaller groups that journey "close to the ground". This China tour is no exception, families will travel together and enjoy a number of great experiences: cooking classes, riding rickshaws or biking in the alleyways, acrobatic shows, tai chi, colorful markets, calligraphy lessons, pandas, countryside boat and bike rides... while of course covering all the "must" sights along the way. You travel by bus, ferry, metro, plane, taxi, tram, etc. and accomodations are in budget and tourist-class hotels and a couple of overnight sleeper trains. Prices from $3,170, 10% discount for children 15 and under. Minimum age is 5. You can tailor your own tour to fit your personal requirements or to put together your own group made up of your family and friends. Sometimes this might be necessary for example if you have very small children as most tour packages have a minimum age requirement of 5 years old. Having your own private tour has some advantages in that it gives you the most flexibility, given the nature of these tours, they can accomodate any range of budget and comfort level. If you have several people in your group this is definitely the way to go. We give you a head start with these sample itineraries that have been put together for first time China travelers, follow the links for a full description and daily activities planned. China Culture Tour - Family Tour for First Trip to China : This is a 13-day tour covering Beijing, Xian, Guilin and Shanghai. It brings you to the top destinations in great comfort, at a leisurely pace with a good balance of fun things to do for the entire family and free time for enjoying markets, food stalls, the countryside or whatever you might run into in your travels. There are no set departure dates, you choose when to go. Tour includes all transfers, domestic flights and several meals, private transportation for you and your group and a private guide at each of the different destinations. Prices for Adults from $3,579, children under 12 from $2,628. Tour and prices can be tailored to meet your budget.